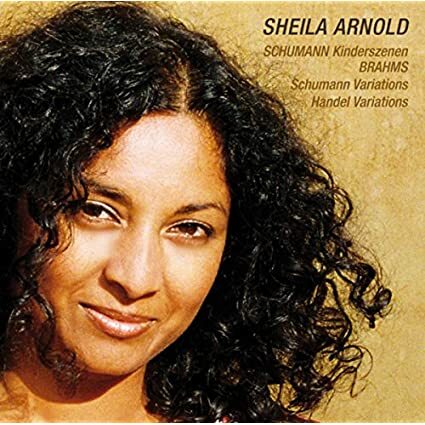 More Brahms from Sheila Arnold, with more Schumann sandwiched in between two works, though this time it's from Bob. The disc opens with Brahms Op 9 Variations on a theme of Robert Schumann, a work I've fancied since I heard Walter Klien's fantastic playing, however horribly presented in the ill-fated Vox set, and Arnold delivers. She can and does play the softer and gentler music, and a fair amount of some other music, with a rounded, attractive touch, but she also unleashes on the piano, playing more severely than Stephen Kovacevich at times. It works very well. Arnold follows with Kinderszenen, and hers is a slightly nervous, agitated view of childhood. The playing generally sounds attractive and usually light-ish, don't get me wrong, but even Traumerei has hints of tension, and then something like Important Event is more than boisterous, sounding perhaps a mite heavier than normal for this piece. That is not a criticism, just a comment. The disc closes with the Handel Variations. Right in the opening movement, Arnold declares digitally that she wants to add her stamp to the piece as she embellishes in a style more befitting baroque compositions. As she progresses, she relies on embellishment, rubato, dynamic shading and other individual to the point of idiosyncratic touches. She also isn't at all shy about belting out some passages. It's serious, but not quite strait-laced; heavy, but not dour. It's peachy. I think I'll do a Ragna Schirmer-Sheila Arnold shootout at some point. That's my idea of fun. It's been a couple months or so for Brahms piano music disc, what, with Ms Arnold's two offerings, Alessio Bax's masterful set, and Arcadi Volodos' Volodosian disc floating in the ether above lesser pianists. And Nelson Freire's new disc is soon to drop. Awesome. I'll be damned if the Brahms isn't just as good. It offers a nice contrast with the more extroverted recording by Italian Invasion vets Maurizio Baglini and Sylvia Chiesa. Pace's piano playing sounds more conventional since he plays a Steinway, and his playing, while not subdued, is slightly more nuanced than Baglini's. Yang's cello playing is more introspective and has a touch of longing to it in Op 38. But there's more than that. The second movement of Op 38 has a light-hearted confessional feel to it, as if Yang wants to impart a fun but intimate anecdote to the listener, and Pace adds some color to the reminiscence. The Allegro ends things on a vibrant note. 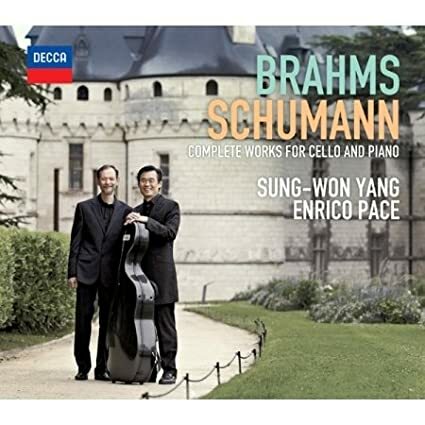 While it's not uncommon to hear later Brahms played in an autumnal manner, here Yang and Pace start off Op 99 by playing in a more extroverted and vibrant fashion. They save the more autumnal stuff for the lovely Adagio, when Yang makes his cello sing. People who dislike vibrato may dislike it, though. Both the Allegro passionato and Allegro molto display suitable levels of energy married to sublime execution and nuance. While I didn't think the quality of the Trio Owon recording a fluke, I secretly hoped Yang didn't cut the mustard in more exposed music. That is not the case. Now I have to pretend that I will mull over whether or not to buy his recording of the Bach Cello Suites. With this recording, I decided to watch some of the accompanying DVD. My four takeaways: Both musicians are very talented; they enjoy working together; there is a reason there are so few Enrico Pace recordings - he doesn't like to record; and Mr Pace's choice of footwear in the studio is most admirable - he uses comfy slippers. ...and Mr Pace's choice of footwear in the studio is most admirable - he uses comfy slippers. Ha! That had me scrolling back up to look at the cover photo! The Fifth. Lim uses the Schalk edition. That's right, the Schalk edition. The very slow opening moments almost sounds like Elgar for a second (this was probably somewhat influenced by the fact that I had listened to Elgar's First the night before listening to this for the first time), but then it becomes obvious that it is indeed Bruckner, as Lim generates an even grander-scaled sound than in the Fourth. Also apparent, this is a swift reading, clocking in at under 64' in total. The Schalk edition cuts to the finale make up a good chunk of the difference when compared to other readings (this finale takes only eighteen minutes and change), but a good portion of the rest of the relative brevity is due to the tempo choices employed by Lim. To his credit, nothing ever sounds rushed. At the same time, it's hard to say anything sounds especially deep. The Adagio, at 15'36", sounds appealing, occasionally weighty, and more than occasionally lithe, but it also sounds, perhaps, superficial, but in a good way. And there are pre-echoes of Elgar again, dammit. There's nary of hint of Elgar in the Scherzo, with its grinding and intense outer sections, all musical fire and brimstone. The Finale is brisk and weighty, and while one can hear Wagnerian influences, one can also hear Dvorak's Fourth, at least as realized by Thomas Hengelbrock. (I assume it's my imagination more than anything.) While the fugue writing gets short shrift here, Schalk did a good job weaving together what he didn't cut. Lim leads the Korean band in some tightly played, well-drilled music-making in the faster passages. I dare say hearing the playing in person would have been at least occasionally exhilarating. The brass are more prominent here than in the preceding symphonies, but much less than in standard performances of this symphony, and there's one transition from brass to strings around eight minutes in that is breathtakingly beautiful, and the quasi-Parsifalesque music that follows sounds hardly less attractive. Later, just after 13' in, Lim leads his orchestra in almost frenzied playing, before letting up just a bit before the revised coda, with its sparkling triangles adding some unneeded zest. Really, drop the triangles and I have nothing major to kvetch about. This symphony has always been the one I've had the hardest time getting in to, but this edition seems to address some of my reservations. Is it wrong to actually like the Schalk edition this much? To some Bruckner purists, the answer is undoubtedly yes. I am happily impure, so I confess that I kind of like it. More than kind of, actually. I may just have to try another recording of the Schalk edition, with Kna the obvious choice I would think. While not ideally clear by modern standards, the recorded sound is excellent, and when cranked up appropriately, the sheer weight of the orchestra is imposing, and the timpani thwacks drive into the ground and then propagate out in all directions causing a not unpleasant physical sensation. Jochum's penultimate recording of the work strikes me as the very apogee of conducting a mainstream edition of the work. For over seventy-seven minutes, Jochum delivers vastly scaled, brass heavy, imposing Bruckner. The opening movement sounds massive as all get out, with Jochum making this the grandest of all the symphonies. It thrills and chills in equal measure, and the Dresden band sounds superb. Extreme depth and/or nosebleed heights are achieved in the Adagio. The Scherzo pulverizes. 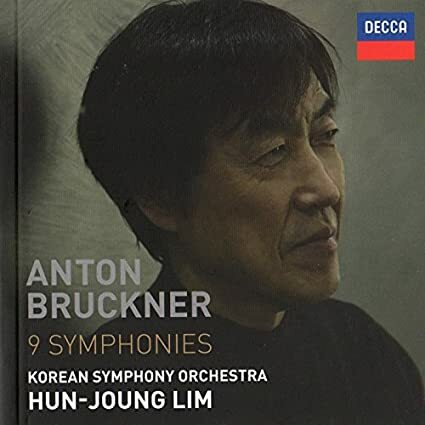 The Finale is grand and powerful, and Jochum makes sense of the contrapuntally dense writing at least as well as anyone, and probably better, and when it comes time to play Bruckner in a frenzied state, no one outdoes Jochum. Throughout, Jochum manages to bring out ample detail while simultaneously delivering musical and musically satisfying symphonic gigantism, and the conductor makes the not inconsiderable length of the work almost zip by. Of the versions I've heard this year of a conventional edition of the score, this strikes me as the best, and if I ever do a full-scale shootout, Jochum would probably be the one to beat. He shows that it truly is a great work. That written, I find Lim's conducting of the Schalk edition more fun. Now, I know Bruckner ought not to be fun, and Schalk sliced and diced the score and re-orchestrated like nuts to play to the gallery, but in some ways, in many ways, he succeeded. Jochum's is the greater recording, but I won't be surprised if I listen to Lim's more often. Jochum's final recording of the work ... It thrills and chills in equal measure, and the Dresden band sounds superb. Thanks for the interesting recap of these Bruckner recordings. Re: Jochum, is "Dresden band" a typo and you meant RCO ... or is there a post-1986 recording of the Fifth with the Staatskapelle with Jochum, too??? Next up, a well known artist for me. I am a big fan of Kun Woo Paik's pianisim, and I own all of his readily available recordings and snap up any new one that comes along, however infrequently that occurs. This Scriabin recording from 1991 offers an aural glimpse of mid-career Paik, just before he signed with Virgin, when he recorded for Dante. 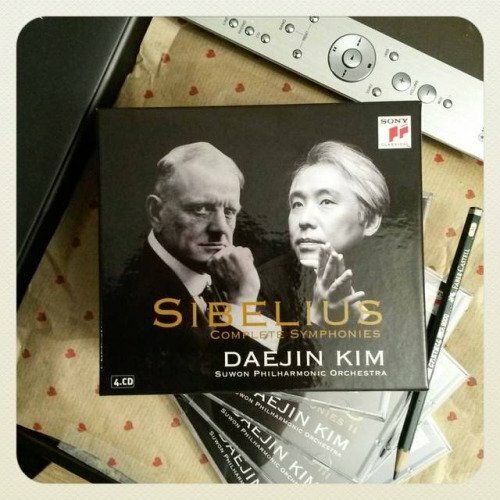 Universal Music Korea appears to have bought the recording, and reissued it in the pianist's home market. It opens with the Second Sonata. The first movement alternates between well articulated passages, and crashing, hard, near ear-splittingly loud passages. Paik eschews gooey legato and avoids any hints of dreaminess. In overall style, it's sort of like a blend of Zhukov and Ponti, with the hardness rendering it more like the latter. In the second movement, Paik opens by scampering along the keyboard, keeping the playing small and light, before erupting into ear-splitting playing again. Next up are the 24 Preludes, Op 11, and the metallic tinge remains as Paik plays the first prelude loud and fast, and while he dials back in the second prelude, and as appropriate thereafter, this is not on the soft-end of the spectrum interpretively most of the time. There are exceptions, as with the gorgeous and delicate 15th Prelude, so at least part of the hardness is an interpretive choice. The Poeme satanique starts off sounding dark and mysterious, but quickly segues to more delicate and attractive playing - the better to seduce and beguile, I suppose - only to then again erupt into ear-splitting playing, with the crescendo at the coda especially loud. Both this work and the following Op 65 Etudes are like miniature encapsulations of Paik's approach throughout the program. The disc closes with the Tenth Sonata, which Scriabin apparently described by stating that 'Insects are the Sun's Kisses', and as Paik has done from time to time on various recordings, he extends the sonata, taking just shy of fourteen minutes to play it. That places him on the slow end of the spectrum in my collection, about even with Lettberg, with only the always idiosyncratic Ugorski taking even longer. He opens gently and mysteriously and slowly, but when the trills arrive, Paik dispatches them with musical haste bordering on the frenetic, and the he moves back and forth between languid and frenetic, or manic and depressive, in uniquely episodic fashion. As the work progresses, the faster playing sounds almost hallucinogenic. Had the sonata been recorded in SOTA sound for the day, it would easily be in contention for best ever version. It probably still is. This individual work is one of the best things I've heard from the pianist. The 1991 recording, using a 1926 Steinway D, is very clear, close, dry, and dynamic, but the piano sounds metallic and almost monochromatic and loses its tuning from time to time. Also, whatever venue was used was not ideally sound-proofed as heavy vehicle traffic can be heard on occasion. While the disc has some definite highlights, most importantly the great rendition of the Tenth Sonata, it is not one of Paik's best recordings overall. 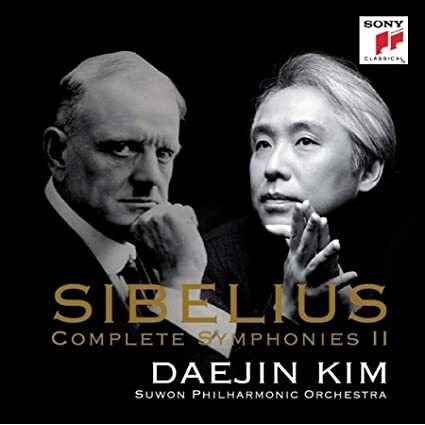 Next up in Kim's Sibelius cycle, I opted for disc one, which has the First and Fourth Symphonies. The First starts off hushed but moves to satisfyingly loud and fast passages. Kim keeps things taut, and he generates real excitement in the climaxes. Kim never really lets up in the Andante, which maintains a nice degree of tension, and then he and his band knock out a sprightly Scherzo before moving to a Finale that opens in searing fashion, before backing off a bit, and then moving into some near fierce playing. Kim and the Suwon Orchestra generate some real excitement here. The Fourth retains some of the intensity of the first, but it sounds altogether starker and colder, more brooding and bracing. Kim brings out some details uniquely, and the orchestra plays well (I rather enjoyed the pizzicati in the final movement). Kim's penchant for avoiding excess works well here, even if one can think of better recordings. I think I'll join you in the Sibelius part of your journey. Listened to this set only once, so far, and perhaps too casually to take much away from it. Tengyue Zhang, from China, just won the 2017 Guitar Foundation of America Competition. I heard two of his three rounds--very impressive technique and interpretations. The Sixth. Given Lim's willingness to conduct the Schalk edition of the Fifth, it's a pity the Mahler edition of the Sixth isn't available, because if anyone would conduct it today, it might just be Lim. Anyway, Lim leads a weighty, slightly swift opener complete with ample power and drive, if not the intensity and drive of others. The Adagio ends up sounding a bit cool, but conductor and band keep it moving along and it sounds beautiful at times, more so than Bruckner often sounds, even if it lacks some of the grandeur of other readings. Both the Scherzo and Finale seem to meld together with the opening movements to create a more uniform whole than some readings, and in the Finale there are some passages with truly satisfying levels of intensity. While the KSO plays well throughout the cycle to this point (and I'll go out on a limb and predict that they continue to do so for the rest of the cycle), some of the violin playing here sounds especially well done. I can't say that this displaces or matches Klemperer, but then no one else does either. Jochum takes the opening two movements just a bit slower than Lim, and he makes sure the brass are prominent and does a masterful job of generating intensity and scale in the opening movement, and he also does better at making the Adagio sound deep in the standard manner, and in his slightly swifter final two movements he generates more intensity and weight and excitement, delivering a grand and romantic symphony. Jochum gets the nod here in one of the better Sixths I've heard. 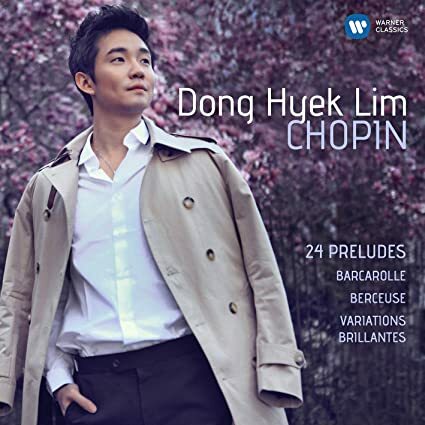 Some Chopin from Dong-Hyek Lim. He's released a few discs on EMI and Warner, and was "introduced" by Martha Argerich, but I've not heard anything from him until now. Mr Lim is one of those young pianists with seemingly limitless technical ability, and he has won various awards, refused his third place finish at the Queen Elisabeth Music Competition in 2003, and tied with his brother Dong-Min Lim for third place at the Chopin Competition in 2005. The disc is given over to the Variations brillantes, another reading (for this thread) of the Preludes, the Berceuse, and the Barcarolle. The opening Variations brillantes is brilliant, indeed. Light, bright, colorful, and dispatched with ease and a glittering panache, Lim delivers a superb opener. The main work ends up being decidedly different from Sheila Arnold's take, but it also has its own very attractive approach. Lim paces things more conventionally, coming in at just under forty minutes, and his approach is more restrained and poetic than Arnold's slow yet aggressive approach. Lim coaxes lovely sounds from his modern grand using fingers alone, as well as fingers and deft pedalling, and he dispatches the fastest passages with seeming effortlessness. His style is somewhat small of scale much of the time, but that's obviously an interpretive choice as he can belt out loud passages with effortlessness, too. The performance/recording is high-grade. If one were to do blind A/Bs with even the biggest, non-idiosyncratic names (eg, no Pogorelich allowed), one may very well come away with a favorable impression of this recording. The Berceuse is gorgeous in its nuanced and largely languid performance, as is the Barcarolle. Perhaps a few times in this last work, one might start to think that a bit more weight would be nice, and then, well, there it is. A superb disc start to finish. Lim's upcoming recording of Mozart and Beethoven Violin Sonatas with Ji Young Lim has already been pre-ordered, and perusing his other recordings, I'm leaning toward his Schubert duo disc with Su Yoen Kim. But I'm even more interested in what he might do going forward. I would love it if he recorded some Liszt, especially of the less showy variety. If ever he comes to town, I will make it a point to not miss him. SOTA sound with no mechanism noise to speak of, but a fair amount of breathing to be heard. More Tchaikovsky from Daejin Kim, here the First and Second. For the First, I decided to do an A/B with Michael Tilson Thomas' BSO recording. In overall timings, Kim takes a bit longer in the first two movements, and a bit less time in the last two movements. As before, he doesn't really go for interpretive excess, and his conducting is not as graceful as MTT's in some spots in the opener. The Adagio is just lovely, though, and it almost evokes old-style cartoon accompaniment, but without the old, old-school mannerisms (eg, no gooey portamento). Maybe it's better to say that it sounds like a movement from a ballet, because that works, too. It's really quite good. Even though Kim leads a slightly quicker Scherzo than MTT, it feels a bit slower and weightier. The Finale starts off slower than MTT's, but segues into suitably energetic playing, with plenty of dynamic range, and the newer recording offers a lot more in the way of bass energy during drum thwacks. An excellent performance. The Second lightens up just a bit in overall demeanor, but is similarly energetic and devoid of histrionics. The Andantino Marziale displays more of that old-timey, cartoon accompaniment sound, and the Scherzo is both weighty and fleet of foot. The Finale is even fleeter of foot and hefty, if perhaps not ideally clear. Another excellent performance. The Seventh. Lim uses the Nowak edition, so here both conductors use the same version. Lim's take is shorter in the first three movements - almost five minutes shorter in the Adagio - and longer in the Finale. The Allegro moderato is grand lite, because while the playing sounds serious enough, it never becomes overwrought. In the taut Adagio, I think I can hear why Lim was credited with causing 'Mahler Fever' in Korea. Just a bit swift and still a bit cool, it seems to move into more of a Mahlerian world, especially with the string playing. The playing sounds meltingly beautiful at times, and while lyrical, there is a sadness to the playing, and though hardly dainty, he keeps the scale less towering than normal. Somewhat as a result, the weighty and smooth Scherzo sounds less dwarfed by what came before, and the trio is gorgeous. The Finale, with its prominent winds and somewhat gemutlich demeanor at times sounds a bit Straussian, and not until about three minutes in does Brucknerianism creep in, and when it does, it's slow motion excitement. The scale and intensity of the movement helps balance out the last two movements with the first two a bit better than in some cases. This is fine performance, though I can't say it matches established favorites. It takes one or perhaps two bars before it becomes obvious that Jochum's reading is the more devout, serious, and probably profound reading. And though Jochum's timings are generally longer, it doesn't sound like it. Jochum's pacing comes as close to perfect as any version I've heard, and combined with masterly transitions and an ability to lead his orchestra in perfectly timed and scaled climaxes, the overall effect is captivating. The Adagio is the heart of the work and properly Brucknerian, and while it is certainly the better of the two versions, it does not sound as beautiful as Lim's. One minor drawback, if it's that, of Jochum's echt-Bruckner approach is that the symphony is a bit lopsided; even though the extended length doesn't register much while listening to the music, it does when the last two movements come around. Jochum leads them about as well as anyone, but the imbalance is unavoidable. Overall, Jochum's recording is a masterpiece, not significantly bettered by anyone. I remember when new and new-ish major label releases featuring the biggest artists of the day commanded premium prices. This Yuja Wang-Leonidas Kavakos recording of the Brahms Violin Sonatas went for under seven bucks new from Amazon when I bought it. That's what I used to pay for Naxos titles. Now, new Naxos titles are around twice that. Go figure. Bizzaro-world pricing aside, what is eminently clear from the opening bars of this disc is that the two artists have no problem playing the music exactly the way they want. Kavakos generates a rich, colorful, at times tenderly beautiful, at times powerful sound. Same with Wang, who seems undertaxed here. Everything is in the right place and everything sounds just lovely, but it lacks a certain spark for me that others bring. And there are so many others here. Pick your favorite set, new or old, and it may be better - but then, it may not. This is hardly a bad disc, but it enters an immensely crowded field filled with great discs and more good discs than mediocre ones. Still, if the duo shows up in these parts, I would happily attend. Sound is immediate and strikingly clear, not surprising given that Andreas Neubronner acts as producer (and has his name misspelled in the credits). Kavakos is miked too closely, with nearly every breath audible, sometimes to the point of distraction, never more so than in the lullaby that closes the disc. Kim's Tchaikovsky Fourth. For this recording, I decided to do an A/B with Daniele Gatti. Gatti's take is lighter on its feet and more classical in approach. It lacks the drive and intensity of other readings, but I still dig it. Kim's take is heftier and more tragic in the opening movement. Kim plays up the dark fate theme from the outset. The movement unfolds in a sometimes stately but never slow pace, which allows Kim to build up tension and intensity within the movement for greater contrasts, and the low strings, in particular, sometimes sound like they are playing some ballet music more than a waltz. As the coda approaches, Kim prods the Suwon to play for all they're worth, then drops off volume sharply, just to bring it right back up. It's especially effective as played here. 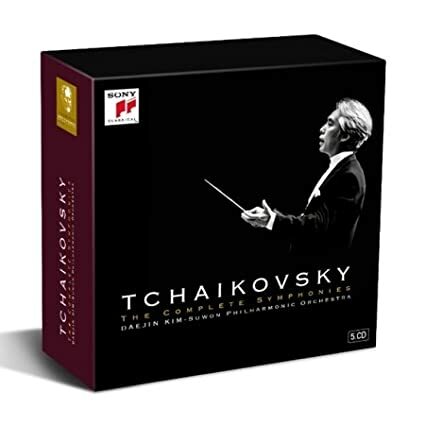 The Andantino is both potent and poignant, the Scherzo is bouncy, with winds that evoke Mussorgsky as much as Tchaikovsky at times, and then the Finale erupts, underpinned by tight and weighty bass that, if the volume is set too high, can nearly pin the listener back in his or her chair. Kim generates notably more intensity and energy than the energetic Gatti here, and when he backs off for the secondary theme, the playing is rich and lovely. Kim wraps things up with a blistering coda that led to an obvious and well-deserved standing ovation. An outstanding performance. Sound for the live recording is not ideally clear, but the dynamic range is outstanding, as is the weight of the orchestra. That's a trade off worth making at least some of the time. Jochum brings his Eighth in at a trim seventy-six minutes and change. Part of this is accomplished by bringing the Allegro moderato in at under fourteen minutes. It's just too zippy and scaled back, and the obvious spotlighting of winds is perhaps a bit much. Jochum maintains dramatic tension expertly, and the orchestra plays portions with searing intensity, but I prefer more grandeur. The Scherzo ends up being a few seconds longer, and Jochum generates enough intensity in the outer sections, and late Bruckner depth in the middle, to fully satisfy. Not at all surprisingly, the lengthy Adagio is masterfully done, exuding grandeur and weight and depth, with nerve-rattling brass, and a sublime ending. Truth be told, Lim gets more beautiful playing from his band, but there's more to this music than beauty. Jochum does the nearly frenzied thing to start the Finale, with a galloping rhythm, a big brass blast, and both sharp and thundering timps. While Jochum lets up a bit, overall, this is one of the most intense and vigorous final movements to this symphony I've heard, and if the back-end lopsidedness ends up more obvious as a result, Jochum makes the symphony genuinely exciting. While a fun Bruckner symphony can be considered bad form, it's hard to envision this type of excitement not being appreciated. Throw in a masterful coda, and it's hard not to like this. That written, I like a grander, maybe even grandiose, style here - Karajan in Vienna, Giulini, Celi in Munich, Gielen - though Jochum probably represents the apogee of a more tightly conceived interpretation. So, Jochum takes it, but in a split decision. For the next post in the Asian Invasion, I decided to do a quasi-A/B with another new addition to my collection. Here, the A/B is with Beethoven's Op 106, comparing the heretofore superb Alessio Bax (superb in Brahms, Mussorgsky, Scriabin, and Mozart) and newcomer Sunwook Kim. I started with Bax. Bax opens with a broad 'n' big Allegro in 106, coming in at just under eleven minutes. Bax manages to evoke both a quasi-orchestral sound in the forte passages and more intimate sound in the quieter music, which he plays relatively slowly. Most important and successful here, he makes his specific tempo choices make sense and transitions flawlessly within the context of his overall approach. Generally speaking, the Scherzo more than occasionally sounds like an extension of the first movement, usually quicker and played in bursts, but Bax does more with it than most. The passages are fully differentiated, and Bax very much makes it sound like a musical joke more akin to something out of 31/3, stylistically speaking. Very nice. The Adagio is on the slow side at near nineteen minutes, and Bax keeps it mostly subdued with melody generally prominent. His often subdued left hand playing allows him to create a nice effect near the end as he gently increases left hand volume to overtake the right. Bax plays the Largo somewhat like the Scherzo, with slightly exaggerated accents and contrasts, but to superb effect, and then moves to a limber, quick, and clear fugue. Perhaps this Op 106 does not display a lot of the late LvB soundworld I tend to prefer, but Bax's approach and execution are sufficiently well done so that it doesn't matter. The Mondschein follows, and here Bax plays the opening Adagio sostenuto briskly, with nervous but gentle forward momentum, moves to a lovely, gently rocking Allegretto, and then plays the Presto agitato with satisfying heft and speed, with his left hand playing mostly held back a bit, rumbling and bubbling just beneath the musical surface. An excellent performance, if not necessarily a top twenty choice. 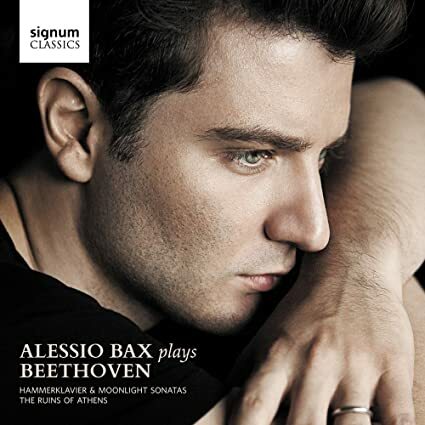 Bax then closes the disc with two of his own transcriptions of music from The Ruins of Athens, including a new one for the Turkish March, and both would make for nice enough encores. Superb sound with more than a few instances of damper noise. 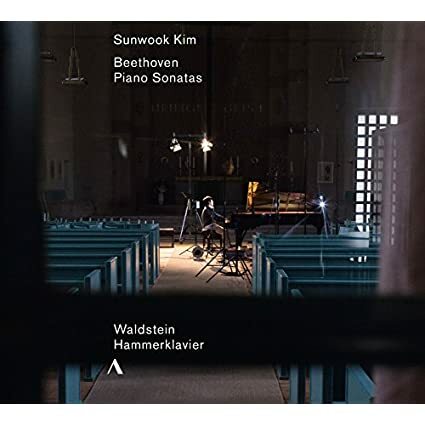 Kim opens his disc with the Waldstein. The opening Allegro con brio is taken at a more or less standard tempo, not too fast and not too slow, and Kim's digital dexterity is obvious. All is clear. But all is also sort of plain. There's not much expressiveness for all the neatness, and one minor item is his terraced dynamics. When the paying should build up to the loudest passages, there's not a lot of variegation at the loud end of the spectrum. The loud playing is perfectly controlled and never ugly, but it's kind of one-note, as it were. The very clean and clear and measured Introduzione is definitely on the unexpressive side, and transitions to a Rondo that only occasionally generates excitement, and often finds Kim playing deliberately. The sonata is undeniably well executed. It's also dull. Like Bax, Kim starts his Hammerklavier with an eleven minute Allegro. Kim's playing is more direct and displays less in the way of dynamic or tempo flexibility or attention to detail. It sounds a tad aggressive and quasi-orchestral, all to he good, augmented by the loud but limited dynamic range playing. The Allegretto sounds more compressed and forceful than the opener, to the good. Kim then plays one of the swiftest Adagios out there at a taut 14'32". It starts off tense, and then for about two minutes after about 6'30", it becomes almost jittery, and the clarity of voices is quite striking. After that, when many or most versions become more desolate and searching, Kim keeps his playing tense and more intimate. Around 11'30" or so, he begins to play in a more desolate style, which ends up being brief as he ratchets up tension nicely and then plays the climax potently. This is evidence that the Adagio need not always be slow. Kim ends the sonata by starting with a restrained Largo and a clear Fugue that somehow manages to be played a decent clip yet still sound a bit stodgy. Sound is close and clear and a little hard, and dynamics seem to suffer a bit, which is a bit odd given that this was recorded at the Jesus Christus Kirche in Berlin in 2015. I definitely, and by a wide margin, prefer the Bax disc in this shootout. Now I have to consider whether or not to hear Kim in recital next season playing the Diabellis. He's got the chops to do it, but I'm on the fence. Maybe his newer LvB disc can help me decide. Kim's Third and Fifth. The Third opens with a bracing Allegro moderato where Kim adopts a, well, a moderate tempo and still generates quite a bit of heft. The Andantino is well played, with winds getting their due, but something feels off. It leaves me cold, though it's by no means bad. The final movement starts off light, with just-right tempo choices, and, again, the winds get their due (I especially dig the flute here). Kim keeps things relatively light until the chorale, where tension and scale build up, but he keeps things reined in. Early impressions here may not end up being my long-term outlook. There are some things I'm not wild about, at least usually, but more than with many recordings, this seems to be one to live with for a while. The opening movement to the Fifth sounds both grand in scale and somewhat severe at times before the tutti arrives, where hints of heroism emerge. (And am I the only one who hears hints of Debussy's Prélude à l'après-midi d'un faune early on in the movement?) Kim then scales back appropriately, keeping things taut until the thundering coda. The second movement is ever so slightly quick overall, with ample forward momentum married to lightness. The Allegro opens very swiftly, but the horns sound like awfully scrawny swans at first. Fortunately, the strings do their thing, and the return of the swan-call has more blat, and the coda, though somewhat abrupt, sounds excellent.